As a wine enthusiast, you probably know the importance of keeping your wine at the right temperature. You probably also know that if you don’t have access to a cellar, a wine cooler is the most convenient solution when it comes to preserving wine. If you have a small collection and are searching for the right wine cooler, you should consider buying a Magic Chef wine cooler. They are reliable, affordable and ideal for those who have collections of up to 45 bottles. The following buyer’s guide and Magic Chef wine cooler reviews will let you know why you should consider buying a Magic Chef appliance. 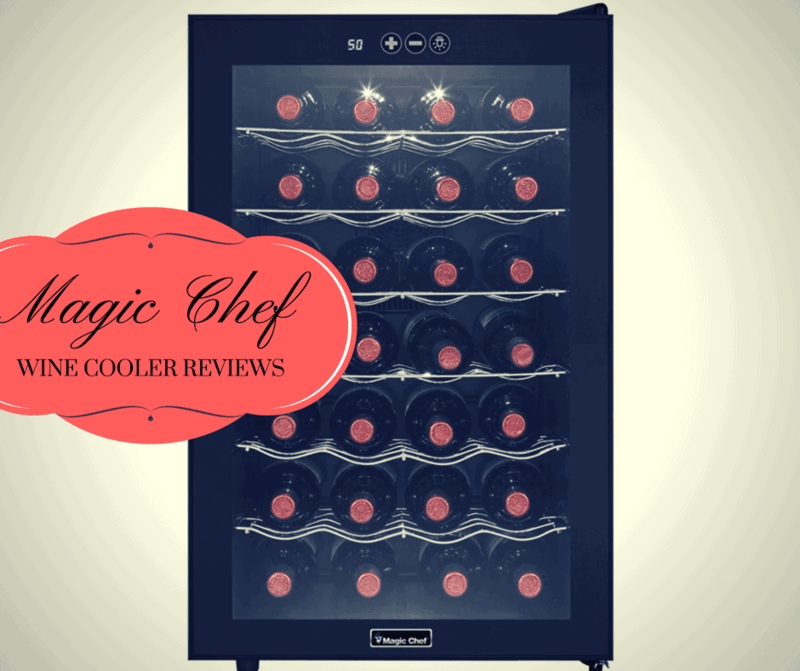 Why Should You Buy A Magic Chef Wine Cooler? Magic Chef is one of the brands of the MCA Corporation, a company specialized in the production of home appliances, including stoves, refrigerators, as well as a series of other home appliances. The Magic Chef brand was born in 1929 and became famous for the high-quality stoves manufactured under the brand’s name by the American Stove Company. In 2006 Whirlpool acquired the brand and used it to manufacture a series of high-quality stoves and other kitchen and household appliances, including a series of compact refrigerators. In 2010, Whirlpool sold the Magic Chef brand to the MCA Corporation. MCA currently uses the Magic Chef brand for a range of kitchen appliances that include compact refrigerators, wine and beverage coolers, small appliances and more. Designed for small spaces and novice wine lovers, the Magic Chef wine coolers impress with their reliability and quality. The manufacturer produces a series of wine coolers specifically designed for small collections, its most popular units being designed for six or twelve bottles. However, if you have a larger collection that is under 50 bottles, you can still find a suitable Magic Chef wine cooler. Under Magic Chef brand are manufactured four types of wine coolers. Suitable for different categories of users, you should be able to find a unit that meets your needs. Let’s have an in-depth look at the features of each category. Designed for collections of up to 12 bottles, the Magic Chef countertop wine coolers can be an excellent solution for you if you want to keep close a few bottles of fine wine.These wine coolers use a thermoelectric cooling system, being silent and having an almost zero level of vibrations. 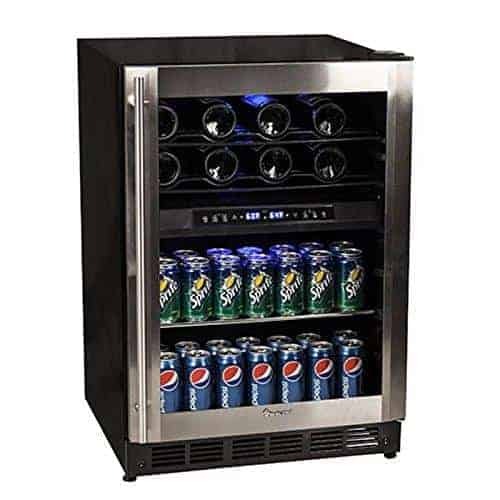 In this category you will be able to find wine coolers with capacities up to 50 bottles, both thermoelectric or compressors.If you need a more versatile solution, such as a dual zone wine cooler or a wine and beverage cooler, you will probably be able to find the right appliance for you in this category. Some of the wine coolers in this category are also suitable to be built in a cabinet. In this category are included all compressor wine and beverage coolers from the freestanding category. The thermoelectric appliances need ventilation to work properly, therefore those units are built only as freestanding units. Using the compressor cooling system, the temperature set is well kept and you can use these units to both store or chill wines before serving. Under the Magic Chef brand is also manufactured a portable wine and beverage cooler that represents a very convenient solution if you need to chill your wine at a party or event.This unit has an adjustable temperature that ranges from 32 to 61°F, being suitable for chilling at serving temperature both red and white wines. The cooler can also be used to keep chill other types of beverages, being a versatile solution if you need mobility. As you can see, regardless of your needs, you will probably be able to find the right Magic Chef wine cooler. The following reviews will help you choose the best Magic Chef wine cooler. We also included an alternative, in case none of the Magic Chef units will convince you. 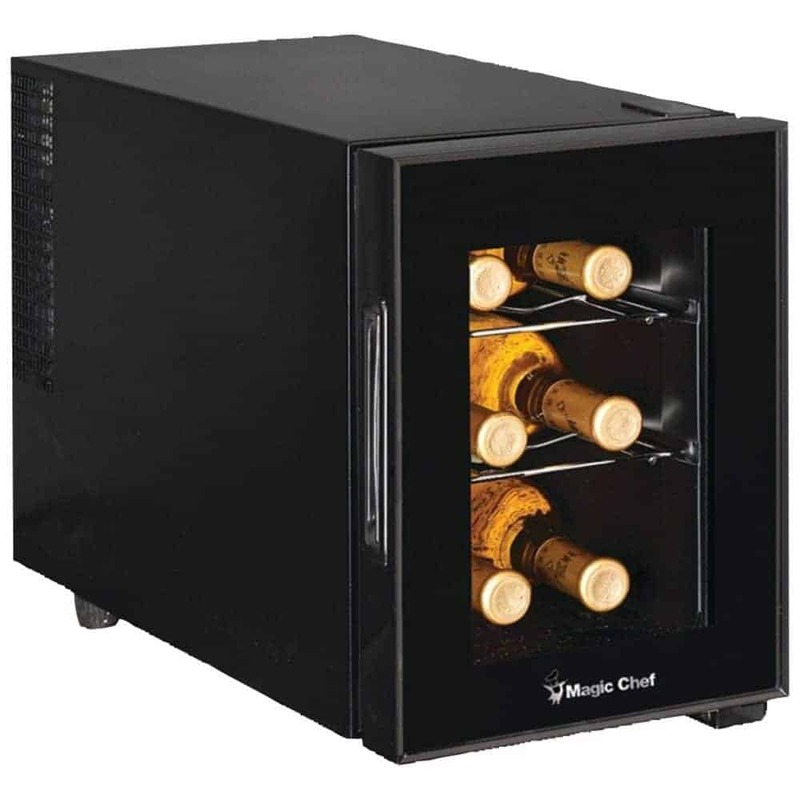 This small countertop Magic Chef Wine Cooler is one of the most popular units of the brand. Ideal to store up to six bottles, this single zone wine cooler represents an excellent choice especially if you have just a few valuable bottles that you want to keep close. This wine cooler can be successfully used to chill a red wine before serving, or to preserve a very small collection of whites. This wine cooler has an impressive cooling capability for a unit that is equipped with a thermoelectric cooling system, the temperatures ranging between 46 and 64°F. Elegant design: this wine cooler has a sleek and modern design, its black cabinet fitting well in any décor. Adjustable leveling legs: you can place this wine cooler on uneven surfaces thanks to the leveling legs that can be adjusted according to your necessities. Soft internal light: if you want to admire your wines or choose a bottle, you can use the convenient soft blue internal LED light. Removable shelves: the wine cooler is equipped with two removable sculpted chrome shelves, a feature that will allow you to store larger bottles. Adjustable temperature: the thermostat will allow you to set the right storage or chilling temperature for your red or white wines. When a lower temperature is selected the fan seems to be a little noisy. Keep this in mind if you want to place the unit in a living area. The big brother of the Magic Chef MCWC6B reviewed earlier, the Magic Chef MCWC12B 12-Bottle Wine Cooler not only boasts a larger capacity but also a few additional features that will make you love this unit if you have a small collection of wines. This wine cooler has a 12-bottle capacity and keeps the sleek design of the smaller MCWC6B, including the elegant sculpted chrome shelves. The MCWC12B has three removable shelves, so you will have more options when it comes to adjusting the internal configuration. 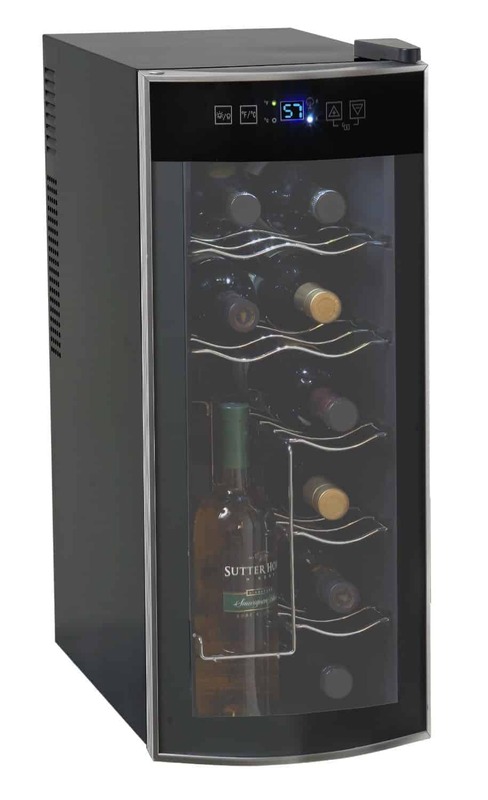 This wine cooler also boasts a soft white LED light that will allow you to admire the bottles without opening the door. Digital controls: this wine cooler is equipped with convenient digital controls placed on the outer side, so you will be able to control and change the temperature without opening the door. Temperature display: the built-in thermostat will display the internal temperature next to the controls, a useful feature as you will not have to use a thermometer. Wide temperature range: you can set the desired temperature between 54 and 66°F. Leveling legs: if you have to place this unit on an uneven surface, you will be able to do so thanks to the adjustable leveling legs. Because this is a thermoelectric wine cooler, if you live in a warmer area the unit might not reach the desired temperature. Remember that the internal temperature will be with more or less 20 degrees lower than the environmental temperature. If you have a medium-small collection of wines, or if you’re just starting to collect wines but you don’t know how many bottles you will gather, then our advice is to invest in a wine cooler with a medium capacity. Magic Chef has the right solution for you with this thermoelectric 28-bottle wine cooler that is similar in many aspects with the two wine coolers described above. This wine cooler is equipped with six removable sculpted chrome shelves and with external digital controls. Therefore, you will be able to change the internal configuration to suit your needs and to control the temperature and the light without opening the door. Freestanding or countertop: this wine cooler is designed as a freestanding unit, meant to be placed directly on the floor. However, the compact size will allow you to use it as a countertop unit too. Wide temperature range: ideal for storing both whites and reds, the temperatures of this wine cooler range between 50 and 66°F. Sleek design: the black cabinet and the glass door with recessed handle give this unit a modern and elegant look. Adjustable legs: similar to the other two Magic Chef units reviewed, this one also has adjustable leveling legs. The temperature will not reach the lowest level if the external temperature is too hot. The fan is also a little noisy. A versatile solution if you are searching for a dual zone wine cooler is the Magic Chef 44 Bottle Stainless Dual Zone Wine & Beverage Cooler MCWBC77DZC. This unit is perfect not only for preserving or chilling wine, but also to store and chill wine and other beverages, being an excellent solution if you have a small business or a family with children. The unit is composed of two temperature zones, the upper one having a capacity of up to 16 bottles while the lower zone has a capacity of up to 28 bottles. You will also be able to choose if you want to place the wine cooler directly on the floor or build it in your kitchen’s cabinet. Dual-zone: in both zones, the temperatures range between 39 and 61°F and can be controlled separately. Control panel locking system: to prevent having the temperature settings accidentally changed, you can lock the control panel. Various configuration options: you can equip this unit with sculpted chrome shelves for the preservation of wines or with chrome shelves, glass shelves or convertible flat racks, depending on your necessities. Compressor wine cooler: using a compressor system, this unit will be able to maintain the desired temperature regardless of the external conditions. The glass shelves don’t seem to be of the best quality and it is quite hard to spot the bottle of wine you want to open because of the layout. 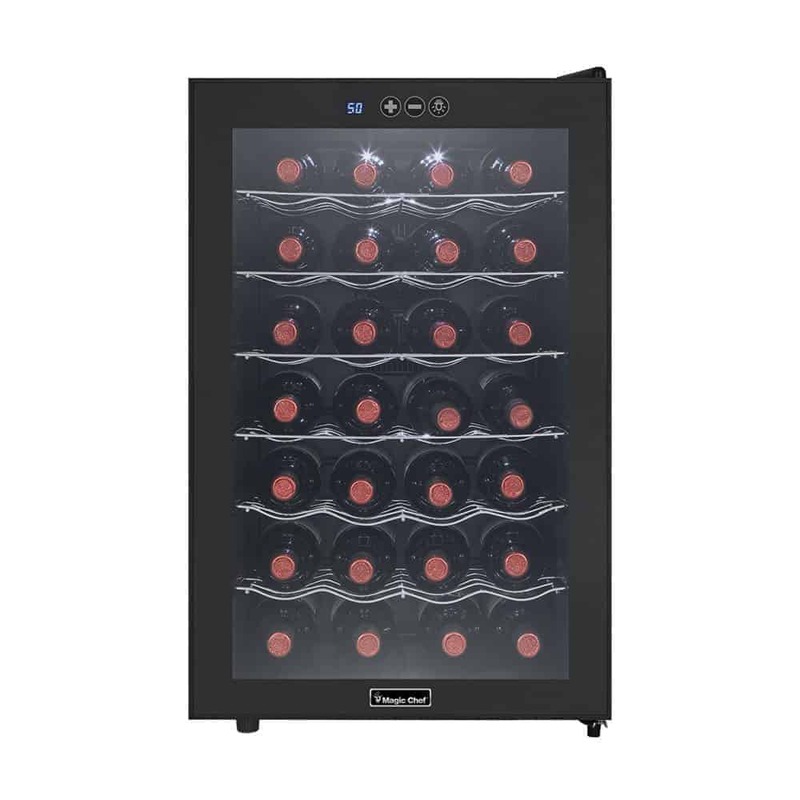 If you have a small collection of wines and none of the Magic Chef wine coolers reviewed above convinced you, then you might like this Avanti EWC1201 countertop wine cooler with a capacity of 12 bottles. This unit uses a thermoelectric system for cooling the wines, creating the ideal conditions for the preservation of both red and white wines. The lack of vibration will not disturb the bottle sediment so your wine will be kept in the best conditions. This single zone wine cooler also has an adjustable temperature, ranging from 47 to 64°F. Great shelf configuration: this unit is equipped with a shelf that will allow you to store up to four bottles in an upright position. Elegant design: able to complement any décor, this unit boasts a black cabinet closed with a sleek curved glass door. Digital controls: controlling the temperature and the internal light is really easy thanks to the convenient digital control panel. Compact: designed to be used as a countertop wine cooler, this unit has a slim design and it is really compact. As most of the thermoelectric units, this wine cooler has difficulties in maintaining the desired temperature. As you can see, there are a few interesting wine coolers manufactured by Magic Chef. 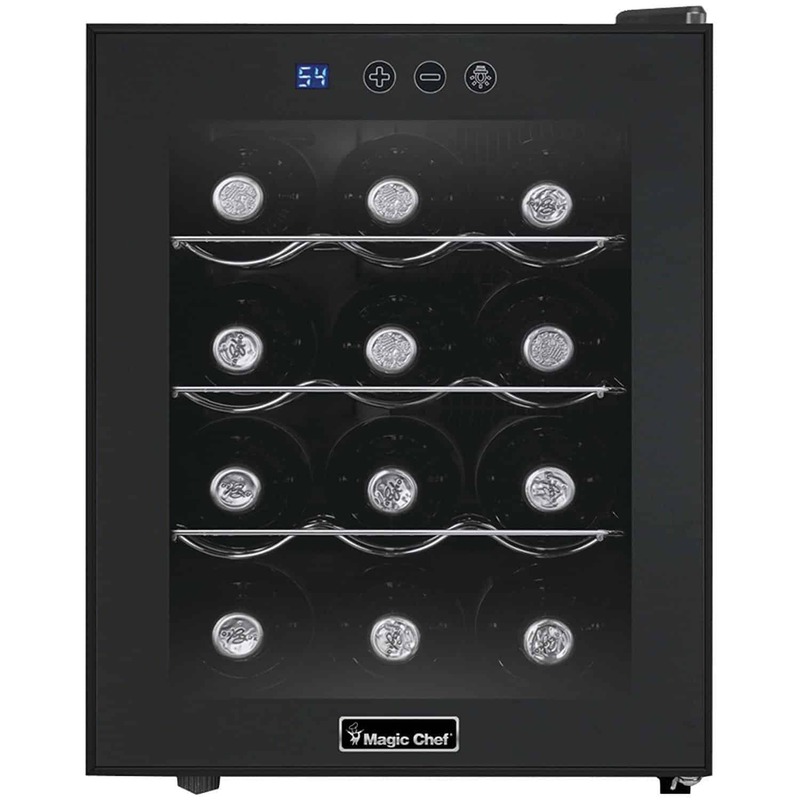 However, in our opinion the best Magic Chef wine cooler is the Magic Chef MCWC12B 12-Bottle Wine Cooler. We like this unit because it is compact, it is ideal for storing a few valuable wines and it can be placed anywhere in the house, being fairly quiet. Equipped with removable shelves, it will be really easy to change the internal configuration, while the convenient digital controls make it easy to set and control the temperature and internal light. So, if you are searching for a Magic Chef wine cooler to place in your living room, home office or kitchen, this Magic Chef MCWC12B 12-Bottle Wine Cooler is the best you can buy.